April 19: I've fallen a bit behind in updating the web site. Last month I took the headlights down and installed them to check the fit. The fit is perfect, and they look great in the car, even if the nose is still in bare aluminum. 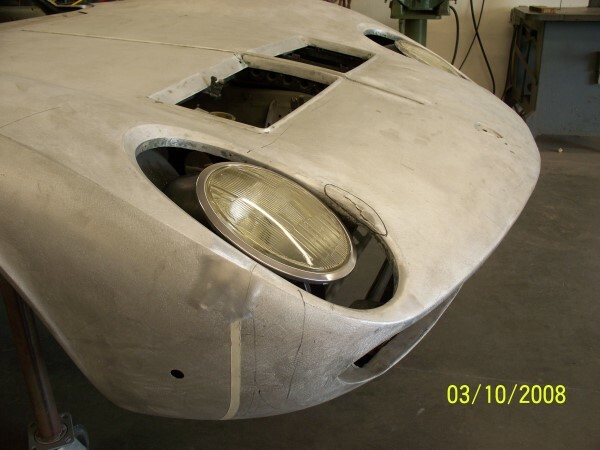 The right headlight opening had a tear in the aluminum where it was very thin and riveted to the front frame. This has been cut out and new, thicker metal has been welded in. 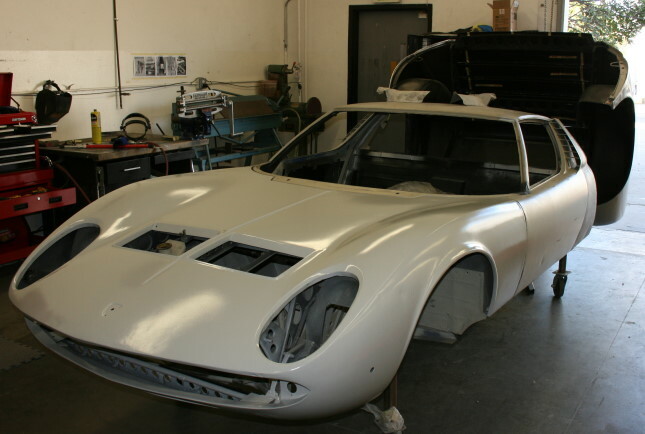 The nose was then primered and the final gapping began. Here is Shane working on the right rear gap. I'm amazed at how much effort goes into getting all the gaps to be consistently even and matching. Metal can be welded onto or cut off of either side of the gap to get it just right. 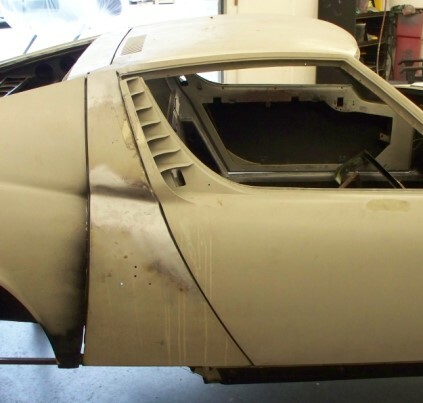 It's this kind of care and attention to detail that is easy to take for granted when the car is finished, but perfect gaps take a lot of work. It's not quite done yet, but almost. 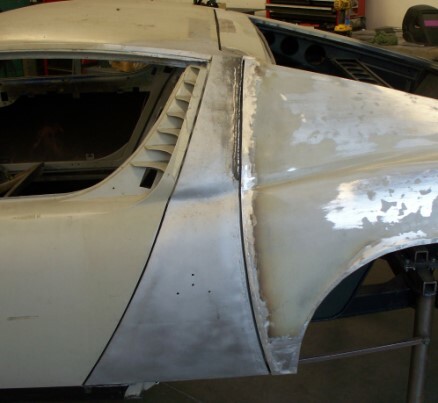 As the gaping finishes, all of the trim parts are fitted to the car before the final body work starts. 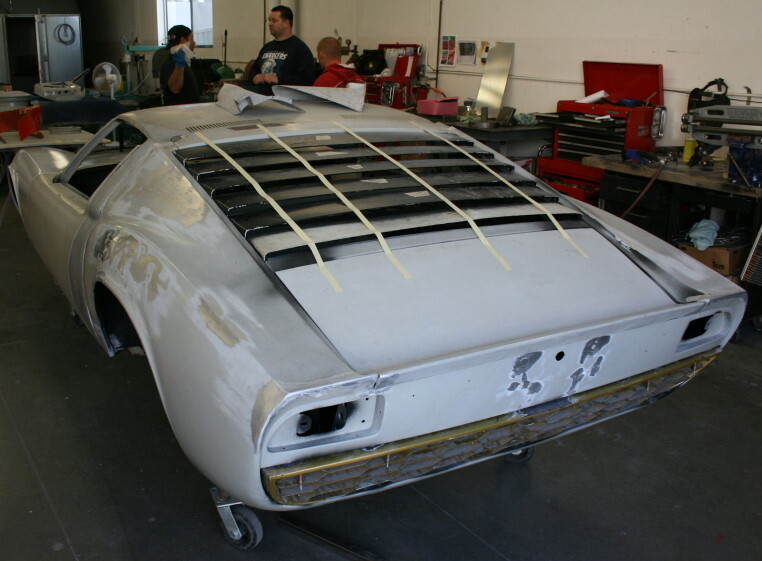 Here the trunk, louvers, and rear bumper are test fit. This makes sure that the body is correct for all the fittings, and that the fittings are also correct. 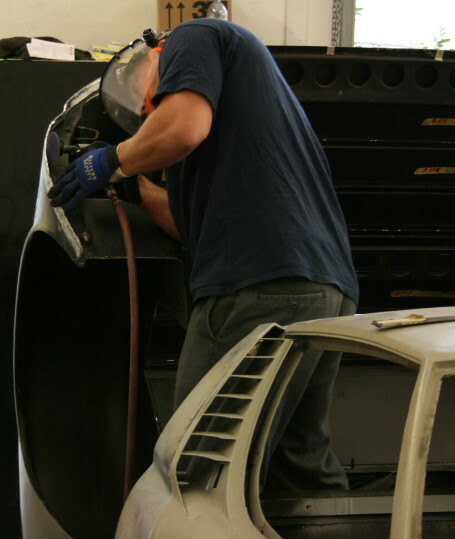 For example, all of the trim around the doors and windows will be installed and adjusted as needed before they are sent out to be chromed. Nigel, Shane, and Dave discuss next steps in front of the car. Or they're trying to figure out how to politely tell this excited customer to get out of their way. :-) Just kidding. I hope. I'll try to post another round of pictures this month. The body team has told me that my car is (now) very straight - better than a lot of Miuras - and the nose is in exceptionally good condition. This is very encouraging. I can't wait to see it in Brambilla Blue.